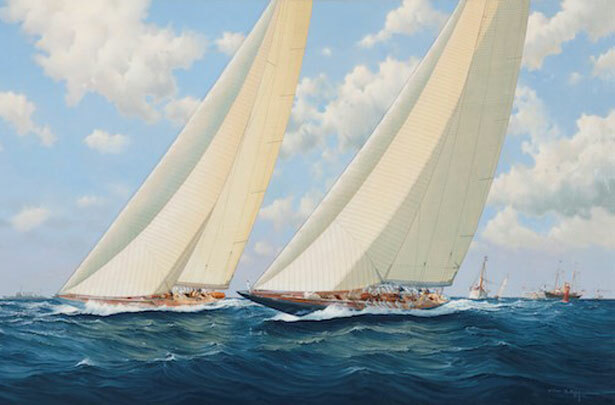 During the Art Deco period the J Class yachts Endeavour and Rainbow raced for the Americas Cup. Endeavour at 129.8ft. o’all. was owned by T.O.M. Sopwith and designed by Charles Nicholson. Rainbow at 127.7ft. o’all. was owned by Harold S.Vanderbilt and was a Herreshoff design. The blue hulled Endeavour was possibly the British J that had the best chance of winning the cup. Mainly due to crewing problems she narrowly failed to do so!